It’s preschool fair time in my town, with everyone clamoring to get their children signed up before there are no spots left. It’s also the time our town takes a census to see what the needs for Kindergarten classrooms will be this coming school year. And the time many parents realize their child will not be old enough to begin school in the fall. 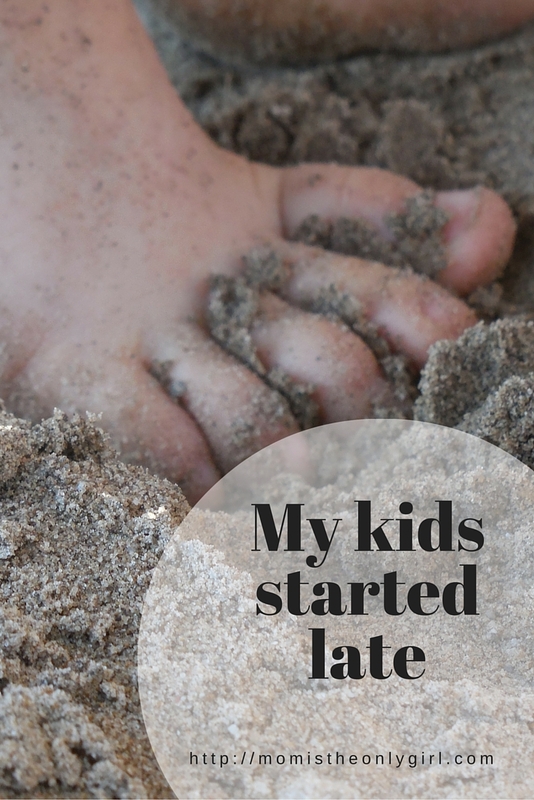 My kids started ‘late’ according to many, but I think this is a good thing! Do I have anything wrong with the whole idea that my children started school, according to others, ‘late’? Heck no! Am I judging others whose kids went to school those falls, or who decided for whatever reason to keep their child home an extra year? No! I’m just sharing MY story, so please don’t feel I’m judging you for any of your child-rearing decisions. Your kids and family are yours, mine are mine. We have different stories and different reasons and needs for doing what we do. I’m just sharing my personal thoughts and experience for those that are in this situation. Have you looked at what kindergarteners are learning these days? Some things I didn’t learn until I was in first grade! Kindergarteners are expected to know their ABCs and 123s upon entering the classroom the first day. If they don’t, they are watched carefully and given extra help. They are expected to know how to write and hold a crayon properly, to know their address, to know how to read basic words. My third grader is learning material I didn’t learn until I was in fifth grade…. I’ve seen several posts by moms concerned and worried about their child ‘starting late’ because their birthday falls just after the deadline for their school. They are wondering if the fact that their child turns six mid-year will hold them back in some way. I’d like to suggest these moms shouldn’t see this as a detriment, but a benefit to their child. A child starting school at a later age than some will go into the classroom more prepared to deal with a new environment and new classmates simply because they are older and they’ve had time to mature in this area. They may be more able to understand concepts being taught and have an easier time learning simply because their brains have had time to form a little longer. At his birthday this past November he was thoroughly enjoying his gifts, but they were a completely different type of gift than he would have received if he were turning seven and in second grade. I also know he wouldn’t be doing nearly as well in second grade both academically and emotionally (as one of the youngest in his class) as he is in first grade (as one of the oldest in his class) having had that extra year at home. And there is no way he EVER would have gotten on a bus to go to Kindergarten a year earlier! He just wasn’t mature enough. What I am trying to say is it’s OK that your child cannot go to Kindergarten this coming fall because their birthday falls after the deadline. Its OK that they will have longer to play and develop better fine motor skills and longer to figure out how to not steal toys from the other children they are playing with, to have longer to be a kid free of obligations before starting school. Please don’t see their not being able to start this coming fall as a detriment, something that will hold them back. Rather, see it as beneficial for them. See how it can help them prepare even more for school next year. As adults we are always trying to get ahead, to improve…consider letting your child be a child for an additional year. It might be the best thing you can do for them!